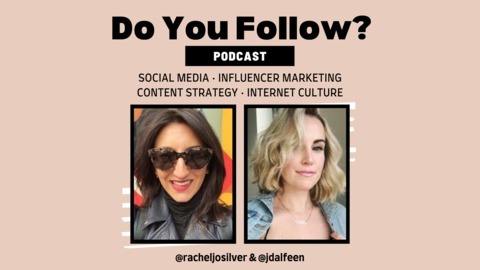 We're @jdalfeen and @racheljosilver—your personal social media gurus, here to solve your marketing riddles. With almost a decade of experience running social media and brand marketing for brands like Birchbox (and now starting our own booming business, Love Stories TV! ), we know the hacks, strategies, and tools you need to win at social media, influencers, and digital marketing for your brand or business. Listen for free sosh med advice—with a sprinkling of our thoughts on Instagram algorithms, the Karadashians, and more. 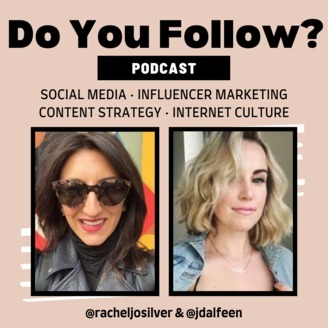 >>> Email doyoufollowpodcast@gmail.com (or DM @jdalfeen and @racheljosilver) and we'll answer your question on a future episode! #34: How do I develop a voice for a user-generated content platform? We're answering a question from a listener who's recently been tasked with developing the brand voice for a large travel reviews site. How do you take it from a mostly user-generated content platform to one that has a more defined point of view? >> Have a social media marketing question? Email doyoufollowpodcast@gmail.com or DM @jdalfeen and @racheljosilver and we'll answer it on a future episode. >> This episode is brought to you by Hungryroot: fresh, clean-ingredient foods that make it easy to eat healthy. Get $25 off your first two deliveries when you visit hungryroot.com/follow. >> Subscribe and listen to our @lovestoriestv podcast, Love Stories Radio, for real wedding advice! #33: How do I deal with declining post engagement as my followers grow? Featuring @molliechen from @hungryroot! #32: Which type of question format gets the most engagement on Instagram Stories? #31: How do I get more comments on Instagram...without looking thirsty? #30: Which type of question format gets more engagement on Instagram Stories?